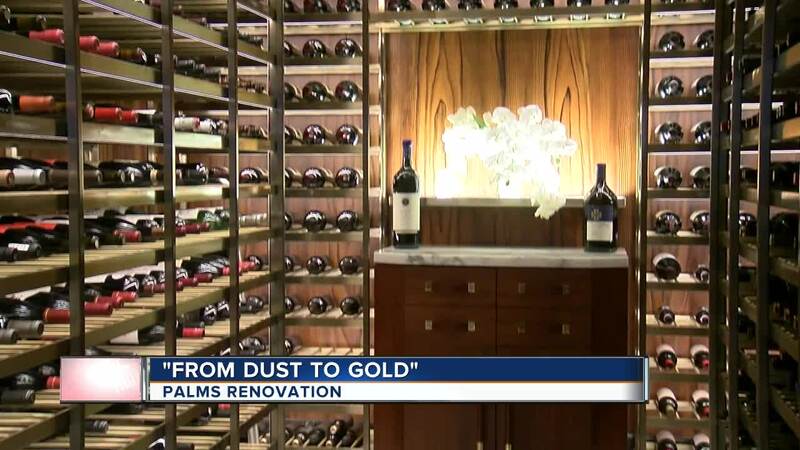 If you have been inside or even driven by The Palms hotel-casino within the past year, you have probably noticed that they have been hard at work inside and outside. They've made changes to the appearance of its casino, added new restaurants, upgraded its movie theaters and updated the Pearl theater. And, there is more to come. Many of these changes and additions will be officially introduced to the public on May 18. In addition, the hotel-casino has launched a new advertising campaign titled "From Dust to Gold." Guests will encounter a one-of-a-kind art program interwoven throughout the property, including a number of pieces from the personal art collections of Frank and Lorenzo Fertitta, with works by globally-renowned artists Damien Hirst, Jean-Michel Basquiat, Andy Warhol, and Dustin Yellin. foot-tall, 60-foot by 54-foot LED screen dual-sided marquee. The resort recently unveiled an all-new VIP check-in lounge where guests are welcomed into an opulent retreat. from Jean-Michel Basquiat, Andy Warhol, KAWS, Damien Hirst, and Scott Hove. Carbonara in a lively setting. menu, including highlights such as fluffy buttermilk Nutella pancakes, zin-braised meatballs, a selection of Neapolitan style pizzas and hearth oven brick chicken. The Pearl concert theater, recently debuted its full remodel complete with a “PEARL” mural at the entrance by Argentinian-Spanish artist, Felipe Pantone and deluxe VIP box accommodations. Notably, the Pearl, in partnership with Live Nation, will host Blink-182’s first-ever Las Vegas rock residency, "Kings of the Weekend." The 16-show run begins May 26 with dates through November. Other leading acts performing this year at the Pearl include Zac Brown Band, Halsey, Niall Horan, Charlie Puth and Alanis Morissette. Two unique concepts from Clique Hospitality's Andy Masi and nightlife partners Ryan Labbe and Jason "JRoc" Craig, Apex Social Club and Camden Cocktail Lounge, are scheduled to open to the public on May 18. APEX Social Club, located in the space formerly known as Ghostbar with the unofficial title of the best view in Las Vegas, capitalizes on a 180-degree view while reinterpreting the 8,000-square-foot space into an open-air boutique nightclub. Four of Dustin Yellin’s Psychogeographies, his famous 3,000 lb. humanoid sculptures, will live in APEX Social Club. Camden Cocktail Lounge, located adjacent to the resort’s main entrance, is a lounge focusing on cocktails presented in a distinctive over-the-top manner with flair. Also, Damien Hirst's first interactive bar concept in the U.S. -- the Unknown -- will be unveiled. The dramatic center bar designed personally by Hirst showcases "The Unknown (Explored, Explained, Exploded) alongside works from his "Pharmaceutical" series of spot paintings. Palms is transforming its look with a sophisticated redesign of all of the Fantasy Tower guest rooms, suites and its six famous Sky Villas. restaurant will debut in spring 2019. In addition, TAO Group will be bringing their “Vandal” restaurant from New York City to the property in spring 2019. These new venues will be joined by a 29,000-square-foot nightclub and 73,000-square-foot pool club, both developed in partnership with TAO Group, which will redefine the nightclub and dayclub experience in Las Vegas. The nightclub and dayclub venues will also open in spring 2019.